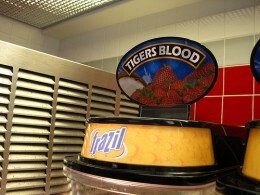 Tiger’s blood: illegal from poaching or siphoned from caged animals? Does Charlie Sheen REALLY drink tiger's blood? where does he get it? Or is it just a frozen ice flavor syrup? From what I just read It was a silly comment that he made! He is not drinking real tiger's blood! A worst it was probably some alcoholic drink!